Valerie Joan Connors. In Her Keeping. Memphis, TN: Bell Bridge Books, 2013. Being a mother is Sylvia Holt’s primary goal in life. She’s desperate to have children. Sylvia isn’t solely concentrated on her desire to be a mom. No, Sylvia is an organized thinker who has a life plan mapped out neatly. Along the way to her maternal objective, Sylvia has crafted a full professional life in Atlanta. She is a trained CPA and owns a small yet successful practice specializing in personal tax returns and small business consulting, where she met her husband of eight years, Jonathan. A client first, Jonathan hired Sylvia before his family business started booming. Once Jonathan’s textile business expanded, he decided to partner with a larger firm with more corporate expertise. Jonathan and Sylvia initiated a personal relationship though and got married, which brought Sylvia closer to her dream of a beautiful home and family. But Sylvia is two years behind schedule. By thirty-five she had intended to be raising her children and working primarily from home. At thirty-seven, she is childless and has struggled to carry her pregnancies to term. Sylvia has researched all options from In Vitro Fertilization to fertility drugs. Meanwhile, Jonathan spends the majority of his time in Hong Kong on business. After her fifth miscarriage, Sylvia’s hope of being a mother is fading. Worse, her faith in her marriage is tested after she discovers an instance of Jonathan’s infidelity. Not to say she isn’t angry, but Sylvia isn’t ready to admit defeat. Definitely not at thirty-seven when it seems too late to start over. She and Jonathan consider adoption. However, it becomes clear that Sylvia might be forced to embrace a fresh start, whether she likes it or not. And that might not be such a bad thing. 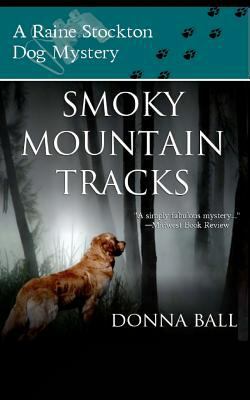 She strays from her plan and winds up in her vacation home in the mountains of North Carolina without a spouse, without a child, and without a job. Soon Sylvia discovers Tiger Hills, a sanctuary dedicated to large cats that borders her property. She meets the owner, Ethan Montgomery, and she learns more about the underworld of breeding tigers in captivity and selling tiger parts for illegal profit. Unwittingly, Ethan’s mission captivates Sylvia and she quickly plays an active and integral role with the sanctuary. There are several bumps and near disasters for the budding nonprofit, and plenty of intrigue that somehow manages to keep Jonathan in her life. However, Sylvia realizes that she still might be able to attain her former dreams. In fact, straying from her preordained path might just be the trick to bring her closer. In Her Keeping is Atlanta-based writer Valerie Joan Connors’ second work and it’s a slim novel, verging on novella. 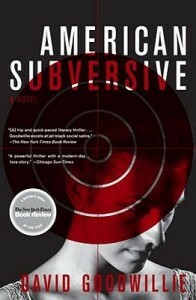 Readers will likely zip through the story and enjoy its unconventional plot line. 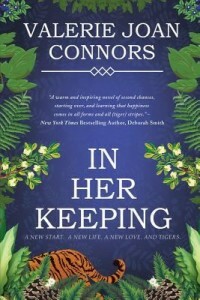 According to a blog post on Connors’ website, she was inspired to write the story after a visit to Tiger World, in Rockwell, North Carolina. Summer Kinard. 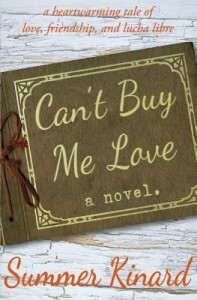 Can’t Buy Me Love. United States: Light Messages Publishing, 2013. Does love at first sight count when only one person is looking? After Vanessa Fauchon digs three scrapbooks out of a dumpster, she falls in love with an attractive Latino man who appears in the photos. For Vanessa happening upon the scrapbooks was part luck and part routine. Vanessa is a freegan. Freegans, essentially, do not believe in purchasing any consumer products, even for basic needs like food and clothes. Instead, they rely on thrifty thinking and dumpster-diving to make ends meet in a sustainable lifestyle. Shortly after Vanessa discovers the scrapbooks she breaks up with her deadbeat boyfriend and dumpster-diving partner, Bradley. Although Vanessa and Bradley share physical compatibility, they lack the same long-term desires. In the near future Vanessa hopes for children, while Bradley believes she should get sterilized for the good of population control. Bradley is a vigilant freegan and wields his ideology to shirk responsibility. Vanessa suspects that Bradley is lazy and masquerades that fact behind his tenet of simplicity. If he does not receive something free out of an encounter, then Bradley has no interest in exerting any effort. Fortunately, Vanessa is a member of Fructus, a women’s group that meets to socialize, crochet, and support one another. Fructus has a range of strong, unconventional female members, from a luchadora to an ethics professor. The women of Fructus help Vanessa during her weakest times and implore her to seek out a more fulfilling relationship. Bradley is a leech of a character and Vanessa struggles to remove him from her life. By contrast to Bradley, Vanessa is a hard worker who tends bar at a local brewery. One night, in a moment of complete serendipity, she recognizes a familiar face from across the bar–a face that bears an uncanny resemblance the handsome visage of the Latino man in the foraged scrapbooks. Although Can’t Buy Me Love revolves around a peculiar love story, the friendships between the female characters are the crux of the novel. Summer Kinard, a first-time novelist, has an educational background in religion. She earned her M.Div and Th. M. from Duke Divinity School and elements of her interest in religion emerge throughout the book. Moreover, her knowledge of Durham is evident. She references several local attractions and businesses around the city such as Duke Gardens, the Carolina Theatre, and Locopops. Readers acquainted with the Triangle area may delight in the recognizable portrait of Durham that Kinard has rendered in her novel. All readers can enjoy Kinard’s magical and seemingly improbable love story. 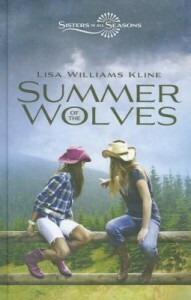 Lisa Williams Kline. Wild Horse Spring. Grand Rapids, MI: Zonderkidz, 2012. Fourteen-year old stepsisters Stephanie and Diana bonded last summer, despite having two very different personalities and struggling with their parents’ new marriages. Socially adept but squeamish Stephanie learned to be braver and to take risks during a family vacation at a ranch in the mountains, and outdoorsy but awkward Diana finally reached out to her new sister. But now a whole year has gone by, the first one in which both girls attend the same school. Diana still doesn’t fit in and gets made fun of, while for Stephanie making new friends is effortless. Diana is jealous and hurt and pulls back from their budding relationship. Stephanie doesn’t understand what makes Diana tick. She’s been sweet and kind to her, just as she is to everyone. But Diana refuses to let her in, retreating into her passion for horses and other animals. Stephanie’s problems don’t stop with Diana: she lives primarily with her mother and her mother’s new husband, along with his 18-year-old son Max. Max calls Stephanie names and drinks behind their parents’ backs. Stephanie yearns to live with her dad Norm and Diana’s mom Lynn, but she’s afraid to ask. When Norm, Lynn, Stephanie, and Diana all go to a beach rental on the Outer Banks for the girls’ spring break, Stephanie hopes she can work up the courage to tell her father what she really thinks, even if it means making things difficult for the adults. But if Stephanie is considering causing problems, Diana can be counted on to stir up trouble. This time it’s the wild horses that roam Currituck’s beaches: Diana becomes obsessed with them, and keeps running off to find the herds. When she discovers a hurt mare hit by a vehicle, nothing will satisfy her but to find the perpetrator, and Stephanie is once more party to her stepsister’s determination. Will the two be able to overcome the new obstacles in their relationship and find out who injured the horse? Margaret Maron. Shooting at Loons. New York: Mysterious Press, 1994. 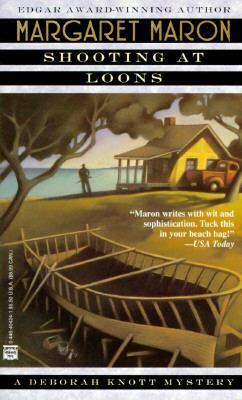 Judge Deborah Knott leaves her seat in Colleton County and heads to the Outer Banks in this, the third installment in Maron’s popular Deborah Knott series. Filling in for a temporarily incapacitated judge in Carteret County, Deborah is happy to be away from her nosy, trouble-making family and back in Beaufort, NC– home to her cousins, and the site of many happy girlhood summers. However, her nostalgic memories are rudely banished when she finds Andy Bynum, and old family friend, floating murdered in the surf. Deborah isn’t sure who would want to kill the amicable fisherman, but his death hangs like a pall over what was supposed to be her peaceful ocean getaway. Andy’s death isn’t the only problem. North Carolina’s so-called Crystal Coast is on the brink of war–with increasing levels of tourism, there is continual tension between the High Tiders, who have been fishing the waters for centuries, conservationists, who want to curtail potentially harmful traditional fishing techniques, and developers, who are looking to get the most out of any land they can buy. Andy Bynum, a local and former poacher who unaccountably founded a conservationist organization, was in the center of the conflict. Deborah isn’t sure who killed him, but it’s a fact that many people wanted the stubborn community leader dead. But who pulled the trigger? Knott must carefully navigate a sea of lawyers, judges, greedy developers, tight-lipped locals, and unexpected old friends to find the killer. Ashley Memory. 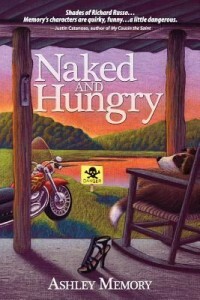 Naked and Hungry. Banner Elk, NC: Ingalls Publishing Group, 2011. H. T. McMullen has been roughing it. Once a successful loan officer with an expensive house, car, and wife, he lost it all to the recession. Disillusioned with his formerly excessive existence, he builds a rickety cabin in the backwoods of his fictional hometown of Yatesville, North Carolina, set deep in the Smokies. McMullen is surprisingly happy living with minimal comforts and growing his own food, despite the uncomfortable proximity of his Bible-thumping, gambling mother. He has his prize motorcycle and an ill-tempered dog named Shorty for company. What more could a man need? But one day he pulls a bright purple fish out of the nearby pond, and his simple life begins to disintegrate. It’s clear that someone is poisoning the surrounding environment, and H. T. McMullen aims to find out who. But it’s more than just a simple matter of cornering the perpetrators. They know H. T. is sniffing around and decide to send a brash message in the form of two bullets– one in H.T.’s leg, and one in his dog, who barely survives. H. T. sends a plea for help to a Raleigh-based environmental coalition, but he doesn’t really expect an answer. He is delightfully surprised when stunning environmental lawyer Jessica Beane shows up on his doorstep, ready to personally take on his complaint. McMullen hasn’t really thought about romance since his divorce, but something about Jessica and her long red hair makes him a bit distracted. Unfortunately, there isn’t much time for a budding affair, since someone is clearly out to silence him. Soon H. T. and Jessica are on the run, and up to their necks in both poisonous water and deadly killers. Ashley Memory’s debut novel, Naked and Hungry is simultaneously a romance, an environmental thriller, and the story of a man’s attempt to reinvent himself in our shifting times. R. K. Hardy. 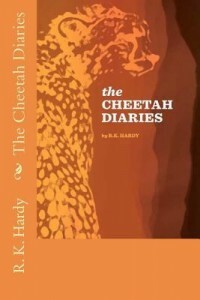 The Cheetah Diaries. Charleston, SC: CreateSpace, 2012. Fifteen-year-old Kenya Taymore is definitely a cat person. This is important, because her veterinarian father owns and operates a big cat rescue sanctuary high in the North Carolina mountains. All of the cats (six tigers, one jaguar, one panther, three leopards, a puma, and assorted ocelots, servals, and margays) are enclosed in spacious habitats designed to mimic their native surroundings as closely as possible. The only cat allowed free range is Kenya’s cheetah, Shaka, whom she raised from a kitten. Shaka is special: Kenya’s mother, a brilliant writer, passed away just over a year before due to cancer. That’s when Shaka entered Kenya’s life, a helpless kitten. Kenya knows that treating a wild animal like a house pet was wrong, but having a constant companion in Shaka helped her survive the initial stages of her grief. Now Kenya is starting her sophomore year in high school and feeling her mother’s absence acutely. The majority of faculty and students at her school are deeply religious, and because of this often use Christian doctrine as a basis for their lessons. Kenya, who has grown up in a household that embraces atheism and science, hates being asked to pray or listening to Creationism presented as a valid alternative to Evolution. She begins to rebel in small ways, one of which is befriending the new English teacher, Mr. Draper. Mr. Draper supports Kenya’s ambitions as a budding poet, and he lends her books that have been banned from the school library. Meanwhile, other teachers and students become increasingly fixated on Kenya. Some attempt to force Christianity on her, while others claim that the scratches she gets from working with large cats are failed attempts at suicide. But Kenya slowly begins to realize the situation is far bigger than her problems at school, and by then it’s nearly too late– everything she holds dear is threatened. R.K. Hardy’s second work of fiction, aimed at young adults, provides an interesting combination of his opinions on the presence of religion in education and how to care for rehabilitated wildlife. 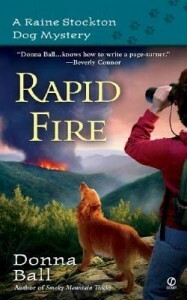 The author includes a note in the back, expressing the hope that readers will check out organizations such as Carolina Tiger Rescue, which is a clear inspiration for the Taymore’s sanctuary.